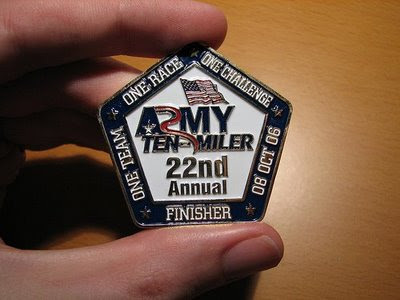 Who is running Army Ten Miler and who is going to watch? I am going to try and be at the start around 7am...then warm up. I don't recall if metro is open that early or not...need to investigate. Plan to head to packet pick-up after the GRC group run on Saturday morning. Apparently there is going to be a small fiesta post-race at one of the two stores...so long as there is interest from all of you? we can have a post race party at the chevy chase store. from 12-2pm. food, drinks and some GRC awards to hand out as a token of thanks for all of the hard work. invite anyone who you think might want to come. Spcial incentive is you get to listen to some of Allen Carr's groovy music. I'm pumped for the Army Ten Miler...Metro is open early Jake. I'll meet you to warm-up at 7.